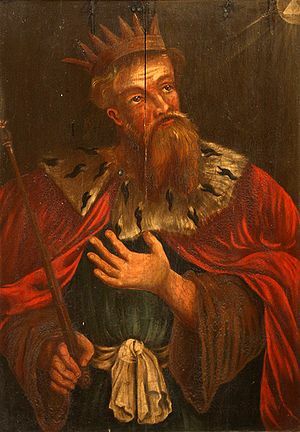 Image via Wikipedia: King Hezekiah, in a 17th century painting. SUMMARY: Ten years ago today, the United States went through the dark days of 911. Moreover, throughout our lives, nearly all of us have had our dark days — our moments of despair and suffering. Yet, as a nation and as persons striving to serve God, Isaiah’s words in 9:6-7 echo throughout the ages reassuring us that a loving God, through his creative, redemptive power, will deliver us. It’s the eighth century (B.C.E.) and Israel, now a divided Hebrew kingdom, was in terrible shape. Threatened by foreign enemies and internal corruption and decay, the entire nation, north and south, was in danger of swift, imminent and inevitable destruction. Once united under the monarchy of Israel’s famous King David, the country was torn asunder by political strife into two kingdoms, Israel to the north and Judah to the south. Now, centuries after David’s death, the jealousy and internal strife between Israel and Judah–blood relatives to each other–signaled the end of Israel as a nation. In a series of prophecies presented to Judah’s King Ahaz, Isaiah warned that unholy political alliances with hostile foreign powers coupled with the social and moral decay of the nation (Isaiah 9:18-20) could spell only disaster for the Kingdom of Judah. It seems almost axiomatic to political history that moral corruption increases a nation’s vulnerability and subjects it to the attacks of its enemies. Such was the case in Isaiah’s day. Back then, prophets theorized that war and defeat by an enemy was a consequence of social injustice and moral decay. Indeed, Isaiah warned, Judah is about to go through some very dark moments in its national history. Yet, despite knowing that Judah’s demise was imminent, Isaiah saw hope for the kingdom’s salvation in God. In a marvelous, elegant passage often read in Churches throughout Advent and Christmas, Isaiah talks of a God who is a “Wonderful Counselor, Mighty God, Everlasting Father, Prince of Peace” (Isaiah 9:6, NRSV). Indeed, Isaiah understood God as a great Creator who, through the ascension of a great king who heart was bent on serving God (Hezekiah), would eventually reverse the course of Judah’s history and thereby be the kingdom’s salvation (Isaiah 9:6-7). But before Judah could reach the glory days of Hezekiah, the leaders and people had to endure the terrible agony and dark days of judgement. Ten years ago today, the United States went through the dark days of 911. Moreover, throughout our lives, nearly all of us have had our dark days — our moments of despair and suffering. Yet, as a nation and as persons striving to serve God, Isaiah’s words in 9:6-7 echo throughout the ages reassuring us that a loving God, through his creative, redemptive power, will deliver us. As we look to God to intervene in our personal situations or to right wrongs in our society or even reverse the course of our history, our darkest moments (both personal and collective) are opportunities to think about the moral choices that we make and realign ourselves with His purposes for our lives. While none of us like the dark days of trial and suffering, we can expect that God hears our prayers and has a plan for our deliverance. The Light ahead that belongs solely to God should give us hope and the perseverance through our struggles. We, with Isaiah, can affirm, even in our darkest moments, “I will wait for the Lord….and I will hope in him” (Isaiah 8:17, NRSV). The Cave of Elijah on Mount Carmel (Author: Joe Freeman). Permission granted for reuse under Creative Commons Attribution ShareAlike v2.5. God then told Elijah to stand near the entrance to the cave and he would speak to him. There, God treated Elijah to feats of nature–a brutal wind and an earthquake followed by fire. Remarkably, Elijah could not find God in any of these natural phenomena. But after everything settled down, there was ” a sound of sheer silence”, easily identifiable to Elijah as the “still, small voice” of God. (1 Kings 19:11-12, NRSV). There were two messages that Elijah heard in God’s silence. First, God assured Elijah that he was not alone in the darkness of his struggle to reform Israel, but was very present in the “still, small voice” within him. Second, from what follows in the reading, God assured Elijah that his will would be fulfilled, not in visible demonstrations of raw power but in the quietness of peoples’ hearts as they listened to the voice of God move within them (1 Kings 19:15-16). In the midst of our struggles, when we feel alone, there are times when we would like to see a visible demonstration of God’s power wiping out our problems and setting things in the world right. Instead, God comes to us in the stillness and quietness of our hearts, assuring us of His Presence in the midst of our troubles by the “still, small voice” bringing us to a faithful, loving and trusting relationship in Him. What’s the “still, small voice” of God saying to you today?